"GIS technology has become a major tool for many of us trying to conserve wildlife." Dr. Jane Goodall, founder of the Jane Goodall Institute. Parker Jones, a long-time Forest & Bird member, has a vision. He wants to see New Zealand rid of introduced pests. And he believes one way to do this is to use smart mapping technology. His charity GIS in Conservation (GiC) was set up four years ago to help conservationists do their trapping, planting, and weeding work more easily (see the case studies below). 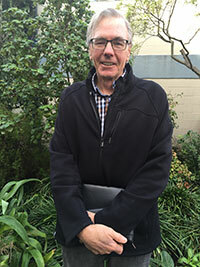 American-born Parker brought Geographic Information Systems (GIS) to New Zealand in the 1980s, when he was working as a salesman for New Zealand-owned IT company Eagle Technology. The powerful US mapping technology proved popular, and Parker sold it to lots of organisations, including the Department of Conservation, Ministry for the Environment, OSPRI, health authorities, and regional councils. Fast forward 30 years, and conservation groups such as Forest & Bird anywhere in the world can now access GIS technology for just US$100 a year, thanks to the generosity of the American developer Esri. But using the complex computer-based technology was a barrier for many. In 2012, Parker, decided he wanted to set up a charity to help conservation groups use the GIS technology. Parker explains: "I felt bad. I would throw this complex software at conservation groups and then leave them to it. So, I thought, why not use my experience and my love of New Zealand to give something back and make a difference?" Parker’s idea was to establish a core group of geospatial expert volunteers who could help conservation groups harness the mapping tool for the benefit of their conservation work. The volunteers and GiC’s committee of experts support projects in different ways, depending on their complexity. "It has been easy to get volunteers. 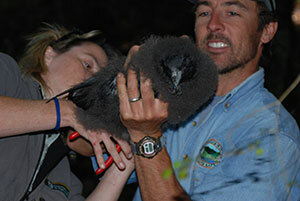 Many of them are very skilled and are keen to help New Zealand’s conservation the skills of our volunteers. It could be anything from an easy mapping project up to something very complex." "I want New Zealand to be pest-free. That’s the big picture, that’s the vision we’re all after." GiC has helped Forest & Bird projects in the past, and Parker would be pleased to hear from any members who would like to tap into GiC’s resources to help their conservation efforts. You can contact him by emailing gisconservationnz@gmail.com. To find out more about GiC, see www.gicnz.org.nz. By Scott Sambell, manager, Glenfern Sanctuary, Great Barrier Island. GIS technology is changing how we do conservation, and I am so thankful to be able to take advantage of that. Parker originally got us onto the ArcGIS software for recording and analysing rodent activity back when he was working for Eagle. We spatially referenced all 820 monitoring stations and created a geo-database with ArcMap, and suddenly we could "see" what was really happening out there. It wasn’t long before we realised we didn’t have regular rodent incursions as we thought. We could see a resident population of kiore had slipped through the net and become averse to our existing biosecurity devices. Realising that we could become much more efficient using this technology, we retired our old waterproof notebooks and began using a field collection app for mobile phones, which then loaded the data directly to the ArcGIS database. Suddenly there was no more "can you please remember to hand in your notebook at the end of the day?" data entry lags and no more “whose notebook is this?” and "I can’t read what you’ve written here" to deal with. When our GiC mentor Shane Pienaar got involved, he boosted it up to the next level. With the ArcCollector App that he put together, rather than email in our volunteers' results or upload to Dropbox, field workers now just walk through the office on their way home, their phone connects the wifi, and their day’s work is automatically uploaded to the database. We can see the day’s results instantly, which makes a massive difference when response time is everything in biosecurity. Shane was also instrumental in getting our remote sensing system off the ground. At the predator-proof fence ends, which are so critical to the effectiveness of the biosecurity system, we have a series of traps and bait stations that "call in" when they have experienced activity. Thanks to Shane, we now have a system that sends us an email when we have caught a rat or feral cat, or simply something has dared to go in a bait station. This data also populates the geo-database so that the time recorded is not the next day when someone checked the trap, but the actual second that it happened. That kind of data is something we have never had before, and we are only just coming to terms with how valuable it is. I have worked with Ngā Hau e Whā o Paparārangi (NHEWOP) for almost three years as a volunteer, sharing GIS skills and providing training and advice. 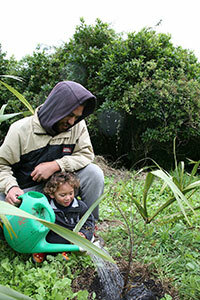 NHEWOP is a 20-year planting project at a suburban marae in Wellington. The overall objective is to restore the local ngahere/native bush to its original glory around Nga Hau e Wha o Papararangi/the breeding place of kiwi, which is in Horokiwi, a semi-rural area close to the suburb of Newlands. This includes planting trees and plants for raranga/weaving, rongoa/medicine, and maara kai/cooking purposes with an overall objective of returning birds and other wildlife back into the area. GIS technology was identified as being crucial to the success of the project because it will aid decision-making and planning efforts by identifying sites for future planting and other activities, such as pest and weed control. I am helping NHEWOP to achieve their goals by mapping, visualising, and analysing the landscape. I have also mentored NHEWOP volunteers Aaria Dobson-Waitere, Scott Bailey, Joe McLoed, and Harry Meinders by providing training in GIS with the aim of making them self-sufficient in mapping and using GIS tools. This will help them manage and plan conservation activities on the site and protect the land for future generations to come. Scott was the winner of last year’s New Zealand GIS scholarship and went to the USA for training and to attend two GIS conferences. 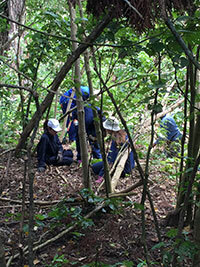 Our volunteers weed the volunteer-planted Home Bay Forest as well as some bush remnants on the island. Their main target is moth plant (Arajuia hortorum), which can severely damage native ecosystems and hinder restoration. In 2014, GiC approached us and offered to explain the benefits of geospatial mapping for conservation groups like ours. In 2014, we started discussing our needs with our GiC volunteer Lucas Mostyn. Lucas, who is based in Palmerston North, developed an in-field app for our volunteers. We started using it last year. GIS maps created by Lucas, and data collected by Motutapu Restoration Trust volunteers using the GIS Collector App on their smart phones, mean that 60ha of the Home Bay Forest is now being effectively weeded for moth plant and other weeds. Complete eradication of moth plant is unlikely, but it can be kept at low enough levels that the native ecosystem can flourish. The main benefits of the new system are that costly GIS recording devices are no longer required, data can be shared between volunteers allowing work continuity regardless of who is doing it, data is immediately captured in the app, and a short synchronisation process is all that is required to update data. Before going to the island, volunteers synchronise the data to their phones. During a grid search for weeds, they can see where they are on the map. When they see that they are near a recorded hotspot, they take extra care in searching that area. New hotpsots are recorded as required. At the end of the day, the data is synchronised back to the shared online database. The Collector App also gives the ability to track a volunteer’s path, so progress of the grid search, which can take more than a year to complete, can clearly be seen. Any other weeds found and identified as belonging to the group for total eradication from the island – for example, panic veldtgrass (Ehrharta erecta) – are also recorded in the Collector App. All data can be shared with DOC for future follow up. The system continues to be fine tuned, and Motutapu Restoration Trust is also looking at new maps to record seed collection sources and to calculate the size of future planting areas. We highly recommend this tool for volunteer weed programmes – it is cheap, simple, and very effective. It saves that most precious of our commodities – time!